Of the miles and miles of beach and bluff along the California coastline, very little of it is actually utilized as golf course. Think about it, Torrey Pines in my neck-of-the-woods, Carmel with Pebble Beach, Spyglass, etc. up in Northern California, and just a handful of others. As far as Orange County Golf Courses go, Monarch Beach Golf Links, the golf course of The St. Regis Monarch Beach, is the only one I know bordered by ocean and is clearly one of the best Dana Point golf courses. Should you happen to be in Southern California for say the Pageant of the Masters or what-have-you, you would be hard-pressed to find a more enjoyable track than this coastal gem. Monarch Beach Golf Links is a Robert Trent Jones, Jr. design. Played straightforward by the everyday hack, it’s a fun walk on an oceanfront park and a generous feast for the eyes. Played by the more serious golfer, it’s a diabolical, 105 bunkered, quick on the stimp, Poa annua green-having thoughtful test and a generous feast for the eyes. A course like this sees a lot fewer rounds per year than your local muni, so the pace of play is perfect. It’s not the kind of place they load up; nobody ever wants to feel rushed or have to wait. We found the course in great shape in spite of our California water woes. As many California golf courses do, they reclaim their water; but I’m told that because of being on the ocean, salt in the air and in the soil is a constant battle. They’re doing a fine job. I was really happy to find that the bunkers were consistent, a big peeve of mine. I sure saw enough of them and, as every green is well guarded by sand or a nice water feature, this may be your experience as well. The fairways are lined by hundreds of beautiful Coral and Pepper trees. There’s no full-size range, but there are cages to get you loosened up and a nice putting green right by the first tee. Be sure to pay attention to the most amazing GPS ever outfitted on a golf cart. It has the usual bells and whistles, flyover, and tips and such, but it is also touchscreen so you can touch the screen where you want to hit it and see exactly what it will take to carry that trap or pond or corner and simultaneously how many yards you’ll have left to the hole, just like my favorite smartphone GPS app. Fantastic! I will say, we were spoiled by having the assistant golf professional and resident course genius, Jackie, who was nice enough to take us around and show us where to and, equally important, where not to hit it. We soon discovered that, without her course knowledge, bad things were certainly possible. For example, during our particular round, the wind was blowing in the opposite direction of what it normally does, so there can be a two club difference from the same spot in the box depending on where it’s coming from, very frightening on a par 3 surrounded by water. It was only without her guidance that I really fell apart, but you’ll follow the GPS instructions, right? A neat feature is that you will never be asked to carry 250 yards over water or foliage, but you would be well advised to make sure when not to hit the big stick. The lack of forced carry is in fact why the course is considered by many as a top resort course for women. Before I get into any trouble for that last statement, please know that I have been humbled by many a woman who has hammered it forty-three yards past my best drive, present company Jackie included. The course is challenging, so I suggest you hit humbly from your correct tee or you may find it too challenging. In the end, it’s the subtlety that will get you. There’s subtlety on every hole on this course. That’s the genius of this architect. The highest handicap hole on this track is a par 5, which are typically opportunity holes. The Bermuda/ryegrass fairways look generous until you recognize that your effective landing area is maybe not as big as you think. Even some of the larger greens are graded in such a way that it’s important to be on the right spot on the green as opposed to just on it, so again, pay attention! Monarch Beach Golf Links is one of the best California golf resorts, so you’re treated like . . . well, like you’re at a resort. The staff is fantastic and attentive. As is the case with most California golf resorts, there is a dress code, but one that is not as strict as some country clubs. Proper golf attire (collared golf shirts and dress shorts or pants) is required. No denim, t-shirts, or short shorts are permitted. One of my playing partners, Annie, said: “Golf is just a bunch of I should haves,” i.e., I should have hit my 3 wood; I should have guarded for the stream; I should not have thrown my putter in that pond; I should have made time to enjoy the offerings at Club 19, the restaurant which overlooks the course. I’m told it’s a fine meal and it sure looked like it on my walkthrough. I’ll be sure to verify that the next time I visit St. Regis Monarch Beach and its golf course. Me, Larry Berle, and course pro Jackie Kazarian at the selfie spot. Be sure to take a picture of the beach and course at the “Selfie Spot” on hole number 3. Remember, Monarch Beach Golf Links is one of only 11 oceanfront golf courses on the entire west coast. You may not get another chance to take that shot. You’ll want to remember your visit. Thank you to Monarch Beach Golf Links for hosting my round and making this post possible. As always, all opinions are my own. 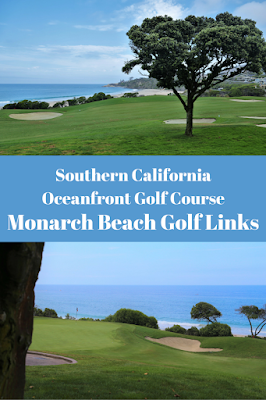 For Monarch Beach Golf Links’ rates and tee times, visit their website.